Although the original PAR-Q is used extensively in Canada and worldwide, barriers in this physical activity participation clearance process have been identified by physicians, physical activity participants, fitness professionals, and various organizations.1–5 For instance, the PAR-Q is purposely conservative, leading to many false positive results and causing considerable unnecessary medical referrals4; the age restrictions of the PAR-Q (ie, 15 to 69 years) create an unnecessary barrier to physical activity participation for children and elderly people; and there is often inconsistent or improper use of the clearance forms.4 Also, the PAR-Q is often a barrier for individuals who need increased physical activity the most (such as those living with chronic medical conditions).1,2 Moreover, physicians commonly complain that the PARmed-X is too long, is very difficult to use, and is not evidence-based. The College of Family Physicians of Canada has not formally endorsed the PARmed-X. The medical community has recently challenged the validity of both the PAR-Q and the PARmed-X owing to their lack of evidence-based support. Because of this criticism, our research team conducted a series of systematic reviews together with an evidence-based consensus process to establish best practices in risk stratification for physical activity participation. The result of this process was the creation of a new pre-participation risk stratification strategy: the new Physical Activity Readiness Questionnaire for Everyone (PAR-Q+) and the electronic Physical Activity Readiness Medical Examination (ePAR-med-X+).3,4 This article will briefly summarize the features of the new PAR-Q+ and ePARmed-X+ and highlight how these tools can be incorporated into daily clinical practice to facilitate risk stratification, physical activity clearance, and exercise prescription for both asymptomatic individuals and persons living with chronic medical conditions. Through this process it was clearly established that the risks of being physically inactive far outweigh the small, transient risks seen after acute exercise in both asymptomatic and symptomatic populations across the lifespan.10 Moreover, there was no sound evidence base to support the age restriction of the old PAR-Q and PARmed-X. An evidence-based risk continuum (Figure 1) was created. Persons at low risk can exercise at low to moderate intensities with minimal to no supervision; persons at intermediate risk should exercise under the guidance of appropriately trained, qualified exercise professionals; and persons at high risk should exercise in medically supervised settings that include qualified exercise professionals. 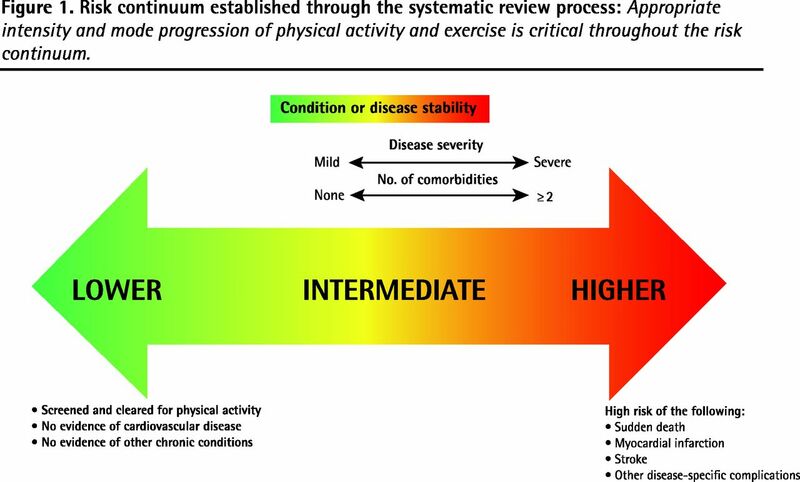 Appropriate intensity and mode progression of physical activity and exercise is critical throughout the risk continuum. This process also formally established the important role that qualified exercise professionals play in the physical activity clearance process for exercise testing and training.4,11 The need to develop clinical exercise prescriptions for persons with chronic medical conditions was also clearly identified. It was recommended strongly that health care providers should avoid using generic physical activity guidelines (developed for use with healthy individuals12) in the treatment of persons living with prominent chronic medical conditions. This was based on an overwhelming body of research indicating that functional and health benefits are often observed in those living with prominent chronic medical conditions at an exercise volume that is well below that currently recommended for the apparently healthy population. A final important finding of the process was the need for researchers to clearly document all exercise-related adverse events. There are several key features to the new PAR-Q+ and ePARmed-X+. For instance, the current PAR-Q+ is a 4-page document that contains a range of questions to identify any possible restrictions or limitations on physical activity participation. Using the PAR-Q+, clearance for physical activity participation is a straightforward process for a physician, exercise professional, or participant. The entire process takes approximately 5 minutes and can be completed in the waiting area of a physician’s office. To begin, the participant simply answers the 7 new evidence-based questions on page 1 of the PAR-Q+. If the answer is no to all of the questions, he or she is cleared for unrestricted physical activity participation following the general physical activity guidelines for healthy asymptomatic populations.12–14 If the participant answers yes to 1 or more of the questions, he or she is required to complete pages 2 and 3 of the PAR-Q+. Pages 2 and 3 of the PAR-Q+ contain a series of follow-up questions on specific chronic medical conditions to either clear the respondent or refer the respondent to the online ePARmed-X+. If the participant answers no to all of the follow-up questions on pages 2 and 3 of the PAR-Q+ regarding his or her medical condition, he or she is cleared to become more physically active. The participant also receives advice on how to develop a safe and effective physical activity plan, including physical activity recommendations that are appropriate for lower-risk individuals with established chronic medical conditions (eg, 20 to 60 minutes of low to moderate intensity exercise, 3 to 5 times per week progressing toward 150 minutes per week). If the participant answers yes to 1 or more questions on pages 2 and 3, he or she is referred to a qualified exercise professional or to the ePARmed-X+ for further probing for pertinent information. At the end of the ePARmed-X+ process, the participant might be cleared for unrestricted physical activity participation or physical activity participation with restrictions. The participant is given a specially tailored exercise prescription to be monitored by a qualified exercise professional or is referred to a physician for additional medical probing or testing. The result of this new screening strategy is that only a small proportion of participants (approximately 1%) are referred for additional medical screening, greatly reducing the burden experienced by physicians when using the old PAR-Q screening process. In this new process, persons previously screened out of physical activity participation are cleared (often self-screened via the PAR-Q+ or ePAR-med-X+) back into physical activity participation.4 The PAR-Q+ screening is valid for 12 months and the ePAR-med-X+ screening is valid for 6 months (to account for potential changes in health status). The newly created PAR-Q+ and ePARmed-X+ tools are evidence-based, meeting the requirements recognized by the medical community. This new risk stratification and physical activity participation clearance strategy allows for persons normally screened out of physical activity participation to be screened (often self-screened) back into participation. The process is easy to complete and administer. In addition, it is applicable to persons of all ages and individuals living with chronic medical conditions. New clinical exercise prescriptions have been (and continue to be) developed for various chronic medical conditions, allowing for the further refinement of exercise prescription. Collectively, this work will further reduce the barriers to physical activity participation for asymptomatic and symptomatic populations, and provide physicians with an efficient, safe, and effective means of risk stratification for patients interested in becoming more physically active.
. The Physical Activity Readiness Questionnaire (PAR-Q+) and electronic Physical Activity Readiness Medical Examination (ePARmed-X+). Health Fitness J Can 2011;4(2):3-23.
. Enhancing the effectiveness of the PAR-Q and PARmed-X screening for physical activity participation. J Phys Act Health 2010;7(Suppl 3):S338-40.
. Executive summary: the 2011 Physical Activity Readiness Questionnaire (PAR-Q+) and the electronic Physical Activity Readiness Medical Examination (ePARmed-X+). Health Fitness J Can 2011;4(2):24-5.
. Evidence-based risk assessment and recommendations for physical activity clearance: an introduction. Appl Physiol Nutr Metab 2011;36(Suppl 1):S1-2.
. The Physical Activity Readiness Questionnaire (PAR-Q+) and electronic Physical Activity Readiness Medical Examination (ePARmed-X+): summary of consensus panel recommendations. Health Fitness J Can 2011;4(2):26-37.
. Appraisal of Guidelines for Research and Evaluation (AGREE) instrument. AGREE Research Trust; 2001. Available from: www.agreetrust.org/resource-centre/the-original-agree-instrument/. Accessed 2013 Feb 1.
. AGREEing on Canadian cardiovascular clinical practice guidelines. Can J Cardiol 2008;24(10):753-7.
. Revised clearance for participation in physical activity: greater screening responsibility for qualified university-educated fitness professionals. Appl Physiol Nutr Metab 2007;32(6):1191-7.
. New Canadian physical activity guidelines. Appl Physiol Nutr Metab 2011;36(1):36-46. (Eng), 47–58 (Fr).
. Evidence-informed physical activity guidelines for Canadian adults. Appl Physiol Nutr Metab 2007;32(Suppl 2E):S16-68.
. How to get breast-cancer survivors exercising? Video games. The Globe and Mail. 2010 May 14. Available from: www.theglobeandmail.com/life/health-and-fitness/how-to-get-breast-cancer-survivors-exercising-video-games/article597012/. Accessed 2013 Feb 1.
. Self-management and biomedical outcomes of a cooking, and exercise program for patients with chronic kidney disease. J Ren Nutr 2011;21(2):188-95. Epub 2010 Jul 21.
. Our team. Richmond, BC: West Coast Bariatric Surgery; 2013. Available from: www.westcoastbariatricsurgery.com/our-team/. Accessed 2013 Feb 1.